I don't report on baseball, so of course I don't have an actual vote for Baseball's Hall of Fame. That doesn't mean that I don't enjoy kibitzing. Since the ballot for this year's class was just announced, I thought I'd go player-by-player, following the standard HoF voting rules of only being able to vote for 10 players. I didn't come close. This is one of those years when no newly eligible player is likely to be elected, unless Todd Stottlemyre shocks the world. The top returning candidate is Goose Gossage, who fell 21 votes short last year, and Jime Rice, 63 votes short. Voters usually feel bad about not electing anybody, so expect Goose to slip in, along with possibly Rice. Using only my memories and the basis statistics I understand, I went through the ballot. Since obviously this post will have nothing to do with TV or movies, those who avoid my occasional digressions into baseball can feel free to wait for my next post. Brady Anderson: Oooh, do we get to put Brady Anderson in the Hall for having the most suspect season in baseball history? That's 16 home runs in 1996 and 18 home runs in 1997 and then 50 in 1996? Nice. That's a .637 slugging percentage in 1996 and no other single season above .477? Nice. It's not like Anderson was a bad player in his other years. He was a good speed guy with a tiny bit of pop for the rest of his career -- a couple 20-20 seasons, a couple years with 10 triples, three additional seasons with 100 runs. He did, however, have killer sideburns just as "Beverly Hills, 90210" was at its most popular. Harold Baines: Harold Baines became a full-time DH around 1987 and then went on to play until 2001, almost never stepping onto the field for defensive purposes. As a result, stats like his 2866 hits, 1628 RBIs, seven All-Star selections cease to have as much meaning. You know how many players in the history of the game have more RBIs than Baines and aren't in the Hall? Barry Bonds, Rafael Palmeiro, Ken Griffey Jr., Frank Thomas and Sammy Sosa. EVER. If not for steroids, those guys would all be in the Hall eventually. You know how many players in the history of the game have more hits than Baines and aren't in the Hall? Pete Rose, Craig Biggio, Rickey Henderson, Bonds. And yet, beyond leading the league in slugging in 1984 (back when .541 would lead the league), he pretty much never led the league in anything. This isn't a hard "No" vote, but Baines going to set a few statistical thresholds for non-induction. Rod Beck: Died prematurely earlier this year. A fan favorite. A three-time All-Star. Saved 51 games in 1998 for the Cubs. Still not a Hall-of-Famer. Bert Blyleven: Gets penalized for not having been dominant. I'll let the Sabermetrics go into things like his ERA relative to the league and other stuff like that. You know what I know? If you're a baseball fan, you'll watch the game for the rest of your life -- even if you live another 50 years -- and you'll never see another pitcher retire with 242 complete games or 60 shutouts. Roger Clemens is at 118 and 46. Greg Maddux at 109 and 35. 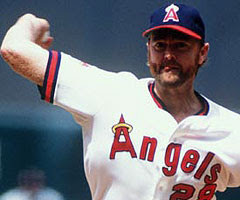 You can penalize Blyleven for his lack of Cy Young votes (three times in the Top 10) his low number of All-Star appearances (two), but he was in the Top 10 in his league in ERA 10 times and in the Top 10 in strikeouts 15 times. So he must have been doing something well relative to his peers. Plus, while his teams usually stunk, he did play on two World Series winners and got wins in both of those World Series. Oh yeah and he had 287 wins and 3701 strike-outs. It's ridiculous he isn't in the Hall already. Look at the mid-level pitchers with half his stats who aren't there. Jeez. YES on Blyleven! Andre Dawson: Fine, take away his contentious 1987 NL MVP, where he won despite playing for a last place team. I look at Dawson's numbers, and I've got an 8-time All-Star, an 8-time Gold Glove winner, a guy who at various times hit 49 home runs and also stole 39 bases (438 and 314 for his career). Throw in 1591 RBIs and 2774 hits... Really, this shouldn't be hard. Imagine how great Dawson could have been if he'd taken advantage of the magical healing powers of steroids and HGH. He didn't. He was a cripple for the last 10 years of his career. From what I can tell, he's being kept out of the Hall because he had a .323 career OBP, which is, indeed, horribly low. But I didn't used to mimic The Hawk's unique batting stance in the mirror because of how well he took walks. Shawon Dunston: I started becoming a baseball fan right around the time Dunston broke into the majors and since WGN was national, he and Ryno and Jody Davis were among my early favorite players. However, having one of the greatest arms of any shortstop of my lifetime (and perhaps, therefore, ever) doesn't put you in the Hall of Fame, does it? But two All-Star games? Good for him. Chuck Finley: Despite 200 career wins, five All-Star selections, 2610 Ks and at least a decade where he was probably among the 15 top pitchers in the American League, he's best known for having been beaten up by Tawny Kitaen with a stiletto heal. Unless that goes on his Hall of Fame plaque, he doesn't get my vote. He was still a really good, probably underrated pitcher. Travis Fryman: Travis Fryman started young and he reliably produced a lot of hits, scored a lot of runs and delivered a fair amount of power (223 homers and 1022 RBIs), so I'd set aside his baseball cards just in case he turned out to be a compiler and made it to 3,000 hits and stuff. Instead, despite five All Star appearances and a perfectly decent career, he broke down toward the end. Decent player, but not even close to a Hall-of-Famer. Rich "Goose" Gossage: With Goose, I have to take a lot on faith. I hear tell of his dominance in the '70s and early '80s, a time I either wasn't born or didn't really watch baseball. The guy I remember stuck around past his prime and was just a middling middle reliever by the end. That being said, I'm capable of looking at stats and seeing that a reliever with 9 All-Star selections must have been doing something right and that those five appearances in the Cy Young Top 6 and five times receiving MVP votes were probably meaningful as well. With Gossage, you run into a problem regarding future closers, because the stats look weird. Yes, he was earning multi-inning saves and they were longer, tougher saves, or so the ol' timers say, but he never had more than 33 in a single season. Anyway, he gets a "Yes" vote from me, but not an inspired one. Tommy John: The first complete baseball card set I got was 1986 Topps and Tommy John's card amazed me because of how long he'd been playing and therefore how small and hard to read his statistics were. Claudell Washington amazed me for similar reasons (he was traded a lot, which shrunk his stats). The reason why the Tommy John Surgery is famously named after Tommy John isn't just that he was the first one to have it. No. John won 20 games thrice after having the surgery and was, in general, a very good pitcher -- four All-Star selections -- through the '80s. What separates him, I guess, from the Suttons, Niekros and Blylevens, I guess, was that he wasn't a dominating strikeout-type pitcher, so his numbers aren't as flashy overall. Going back to Blyleven's CG/SHO stats, I've gotta add that John's 162 and 46 are mighty impressive. But I put Blyleven in a slightly higher category, leaving John in another field with folks like Jim "Kitty" Kaat, who's finally off the Hall ballot now. David Justice: If Chuck Finley's Hall plaque would have to say something about Tawny Kitaen, David Justice's would have to mention Halle Berry. Justice looked like a future inductee when he his 28 home runs in only 127 games and won the Rookie of the Year at the age of 24. He played on an unholy number of really good teams (the guy was always in the post-season, though he was a .224 hitter there) and when he stayed healthy, he usually produced. He got on base a lot (.378 OBP), hit for power (.500 slugging), but just didn't last long enough -- 305 home runs, 1017 RBIs and only 1571 hits -- to be in the discussion. Chuck Knoblauch: Through the age of 30, Knoblauch was on his way to the Hall. He had a Rookie of the Year, five All-Star appearances, oodles of steals, six seasons of 100-plus runs. Heck, the guy won a Gold Glove at second. Of course, as you may have heard, he got the Yips. Stopped being able to throw. The throwing fed into the hitting and that started to go. He was done by the time he was 33. Not a tragedy, but just a little sad. Still a "No" vote. hi! To fuel these baseball philosophies, I'd recommend an occasional visit to the stunning 1952 Topps set, or to this baseball blog. Please do visit my baseball card collecting tips.